One of my most cherished memories of Edgar M. Bronfman, the great Jewish philanthropist and businessman of beloved memory, is smuggling a smoked brisket back from Montreal in my suitcase for him. No really—this happened! Maybe I better back up a minute. Long before I was a mom and food writer living in suburban New Jersey, I was the communications manager for The Samuel Bronfman Foundation in New York City. As part of my responsibilities, I travelled all over the world with Edgar, helping with speaking engagements, arranging minute details of his itinerary, and getting the chance to visit Jewish communities everywhere from Sderot, Israel to Kansas City. It was the week before we were headed to Montreal where Edgar would be speaking to the McGill University Hillel. Viv, Edgar’s much-loved and respected assistant of many years, called me into her office, which was a somewhat daunting occasion as Viv was stylish, funny, and 100 percent no nonsense. I quietly nodded, took the cash, and went back to my desk, trying to hide my enormous smile. A food errand for Edgar to a Jewish deli? This was the most awesome—and sort of random—assignment I had ever been given. It was hard to sit through some of the meetings with Edgar during this trip, because all I could think about was my upcoming deli trip! Finally the afternoon arrived, and while Edgar was in his meeting. I hopped in a car and headed to Schwartz’s, ordered the brisket for him and a pastrami sandwich for me, and headed back to the hotel, where I tucked the precious meat in my suitcase. Later that evening as we descended from the plane back in New York, I handed Edgar his meat and he gave me one of his twinkling smiles. Inside I was screaming, oh-my-god I just smuggled a brisket in my suitcase for my boss. People knew a lot of things about Edgar: He had a wicked sense of humor, he cherished learning, he questioned everything, he was very particular, and oh yeah, he had owned Seagram’s, which was the largest distiller of alcoholic beverages in the world. But he was also passionate about so much more: He took piano lessons, studied philosophy, and while he almost never indulged in snacking between meals, he loved food and would sometimes share stories about his own recipes. Another Edgar food secret? He always made his family’s haroset for Passover. Edgar isn’t with us anymore, but his stories and love of learning live on through his writing, the projects he funded (like this very website), and through the many wonderful people (like me) who had the privilege and blessing to learn with him and from him. 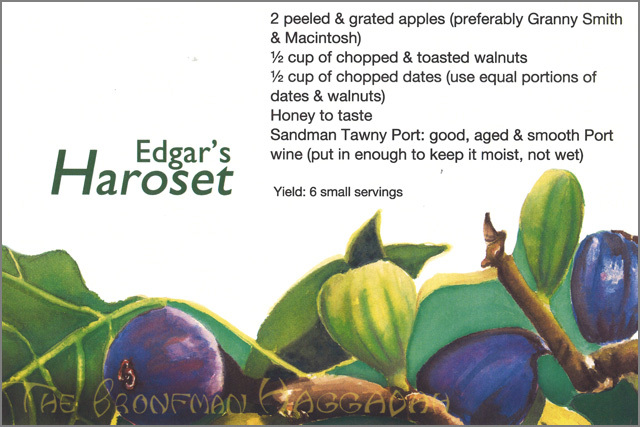 This Passover we’ll be making Edgar’s haroset recipe and making sure to ask a few more questions around our seder table in his honor. 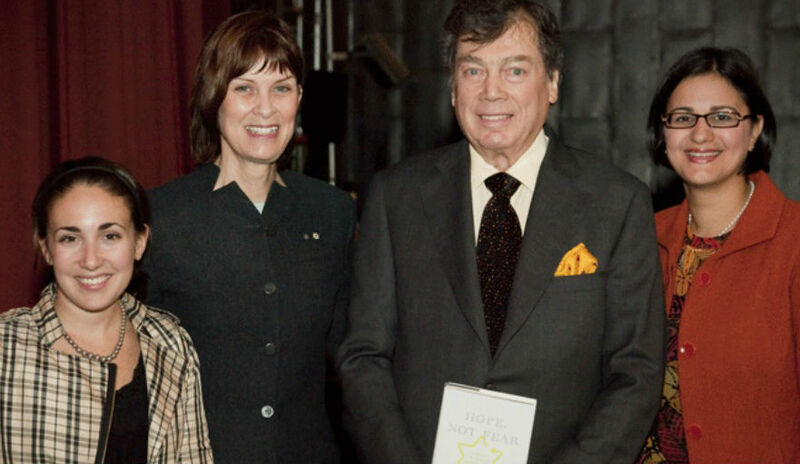 Edgar M. Bronfman’s last book was “Why Be Jewish?” He has also authored “The Bronfman Haggadah” and “Hope, Not Fear: A Path to Jewish Renaissance” among others.